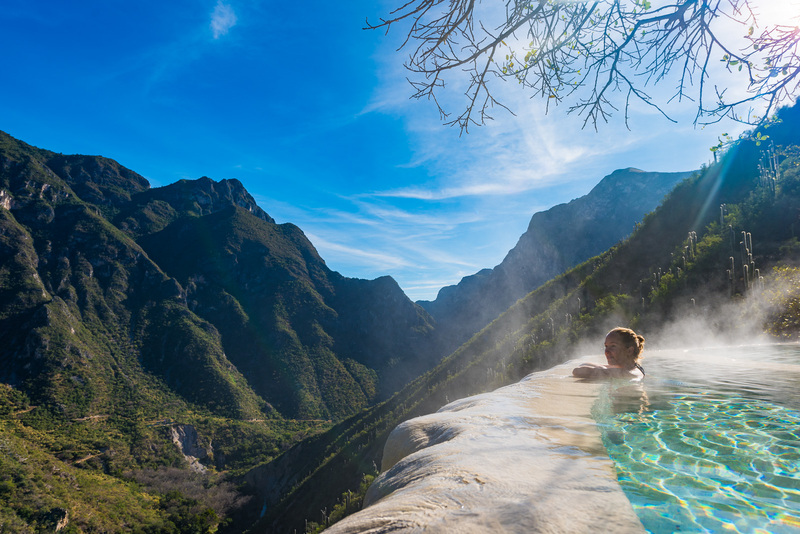 Hidden away in a canyon 200kms north of Mexico City is one of the most special places we’ve visited on our entire trip. 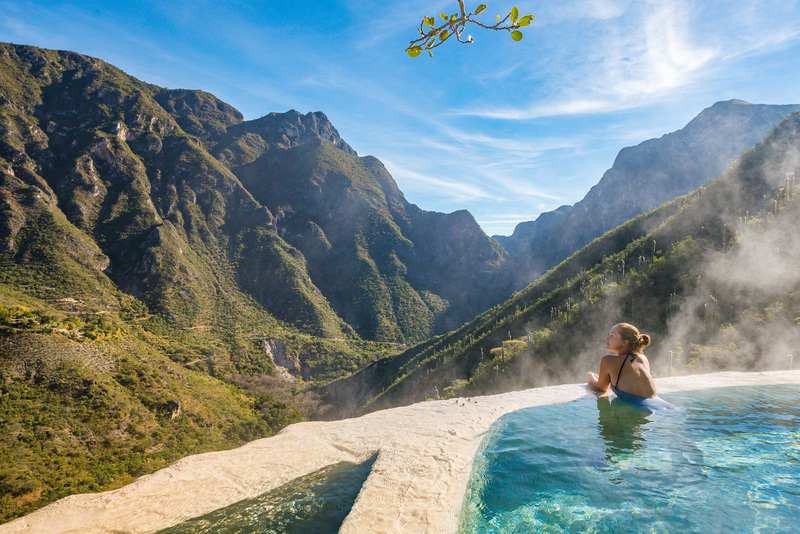 It’s name is Grutas de Tolantongo, and what you’ll find there will blow your mind away. 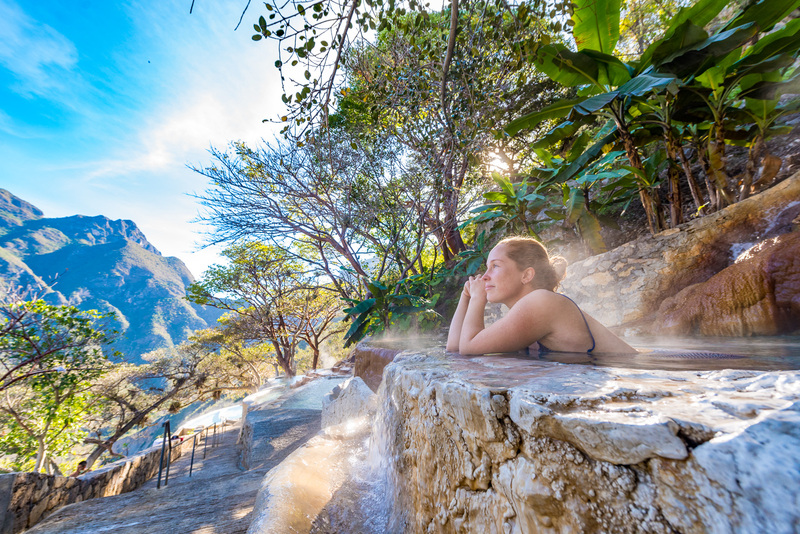 The park is divided into two areas; the first is for those who like to relax in style. 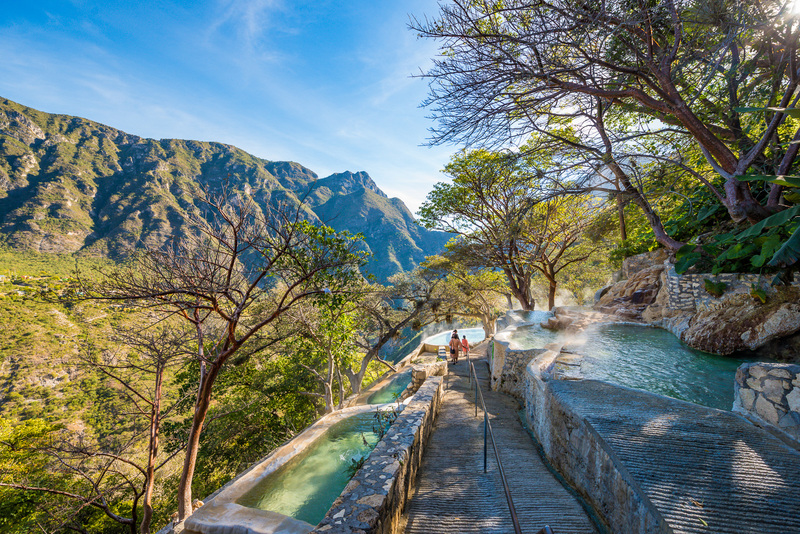 Dozens of beautiful hot springs have been built into the canyon’s wall with incredible views to the mountains around. 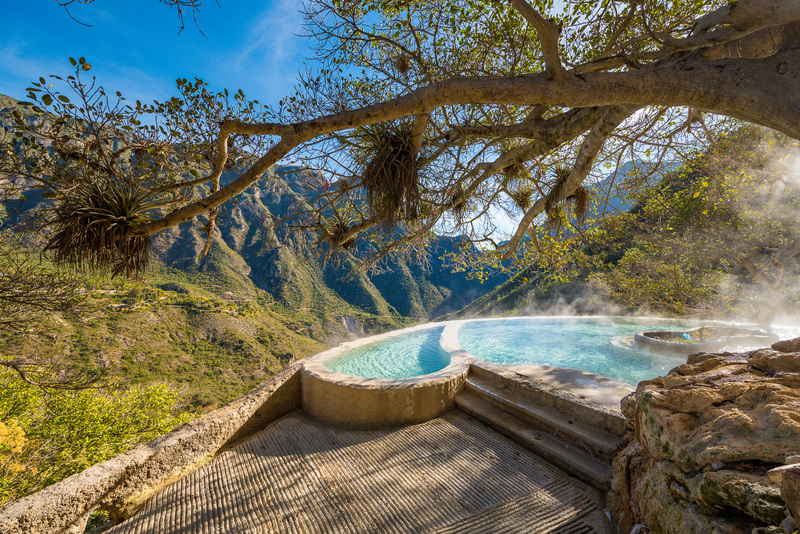 The pools range from 34C-38C degrees and are all unique. 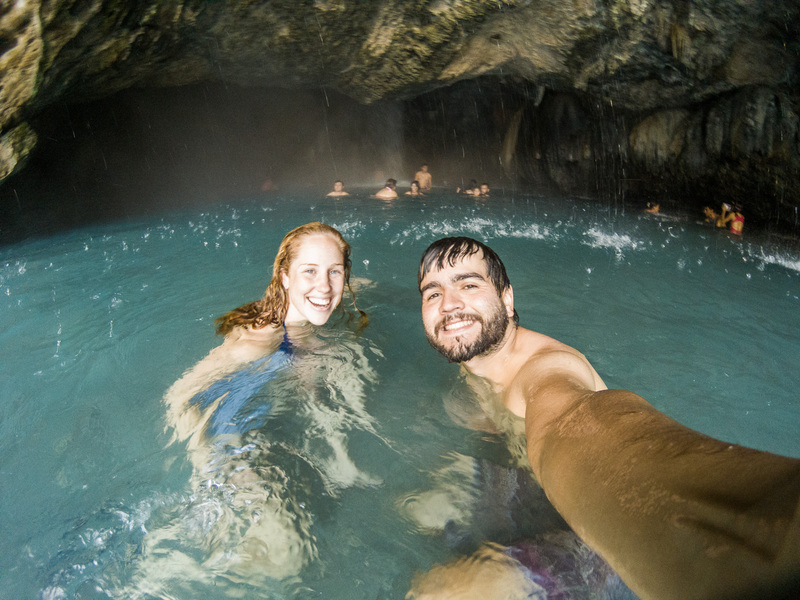 Some have their own waterfalls or hot springs coming up from a crack underfoot and there’s even two pools inside a steaming underground tunnel! 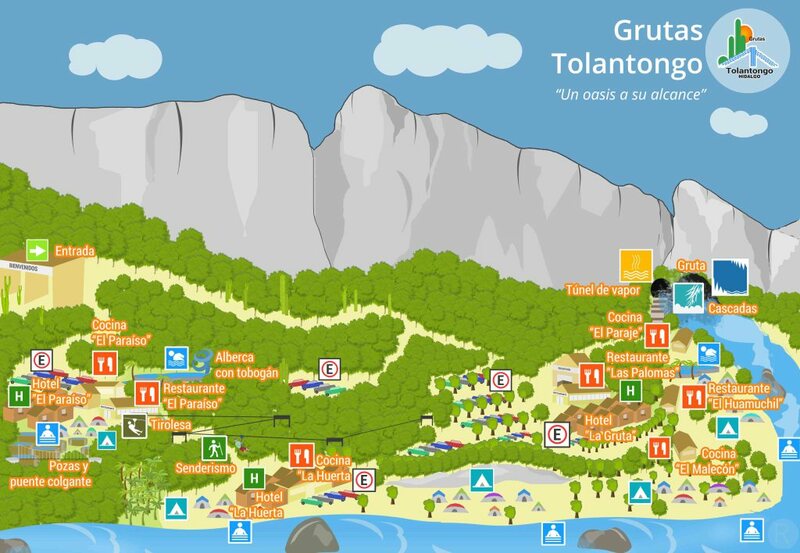 You’ll also find a waterslide, swimming pool, campsites, hotel and restaurants galore. The second area is for those more adventurous. 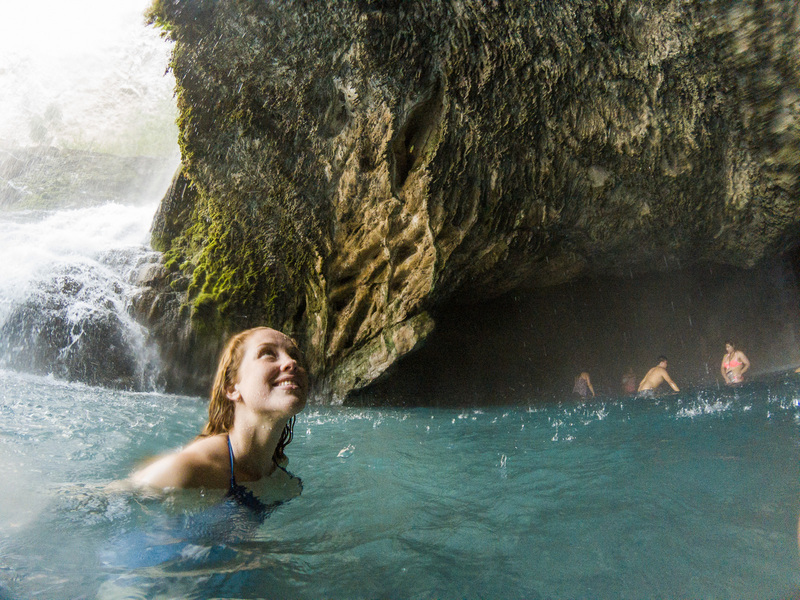 You’ll find two natural caves underneath a waterfall – all flowing and filled with hot water. 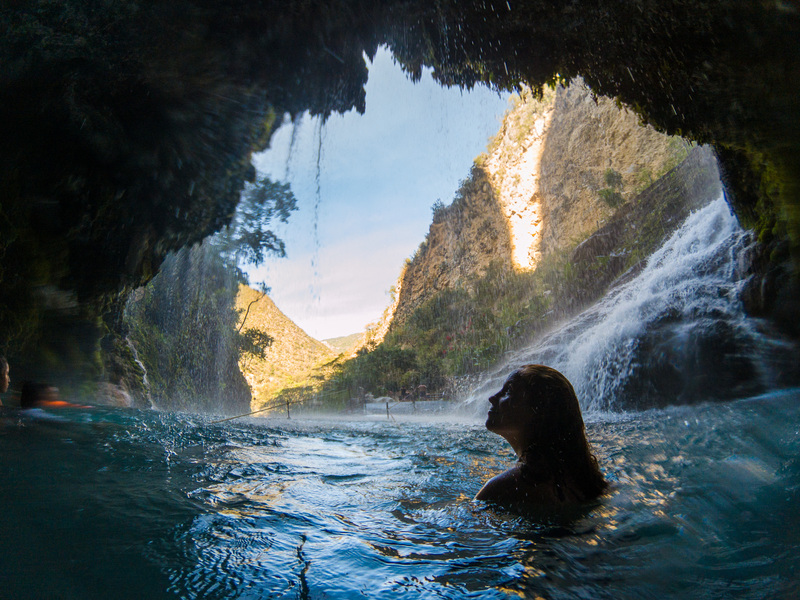 One cave is a tunnel that runs deep into the cliff and steams from the heat of the water trickling down its walls. 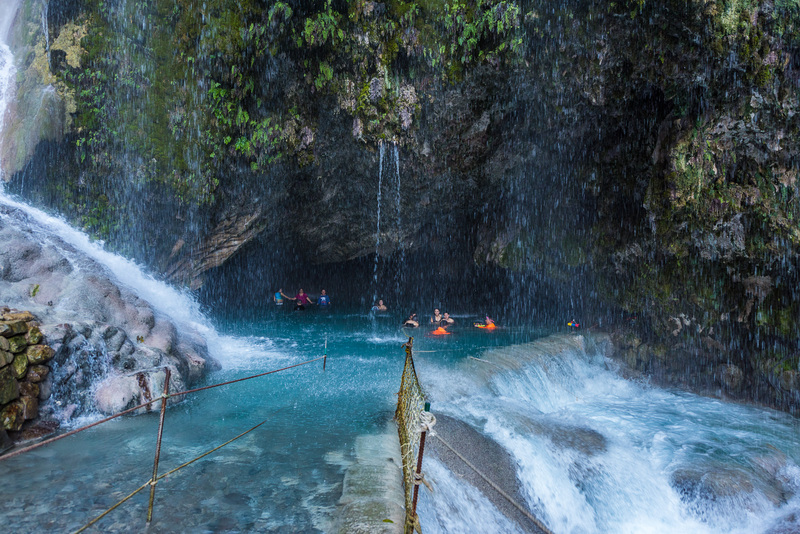 The other cave is filled with warm, turquoise water with a pounding waterfall at its centre and smaller, offshoot caves at its edges. You can explore into these water filled caves, but bring a waterproof torch as it’s pitch black in there! Only the bravest explore deep into the caves. Guides can take you into the deepest caves at your request, and although it’s quite scary, its definitely worth overcoming your fear of the dark or tight spaces to witness one of the most wonderful natural sites in the world. 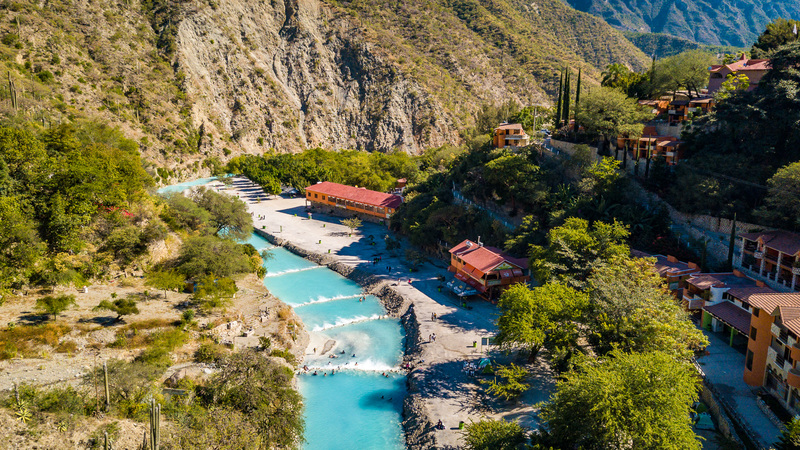 For those not so keen on enjoying the warm water in the dark, right outside is a turquoise river that is also fed by the hot springs. 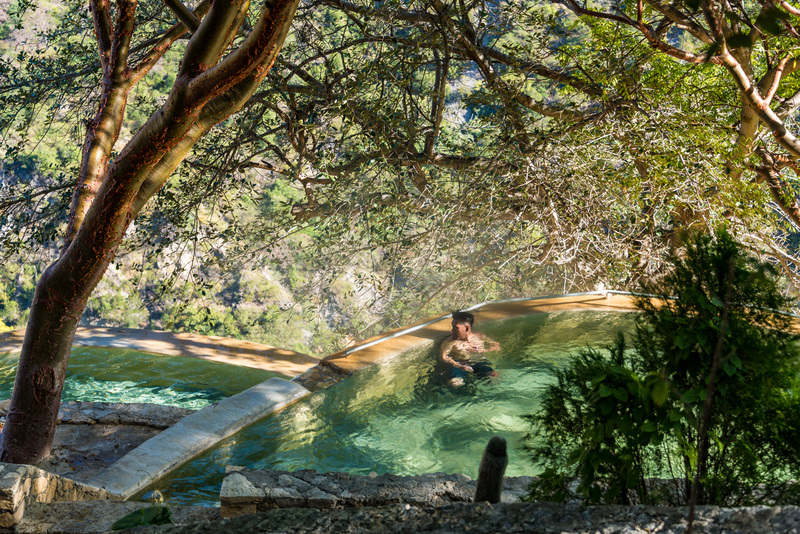 You can swim at any of the rock pools and enjoy the stunning vista under the sunshine. The park with the hot springs on the left and the caves on the right. Entrance to the park is only 140 pesos (around US $8) per person which gives you access to everything apart from the zipline (which just happens to be one of the longest in Mexico). You can even camp for free on the banks of the river (there’s just a 20 pesos parking fee if you’ve come by car). The restaurants all sell generous sized, delicious meals at reasonable prices. A large plate of Chicken schnitzel, fries and salad comes to 95 pesos (just under US $5) for example. 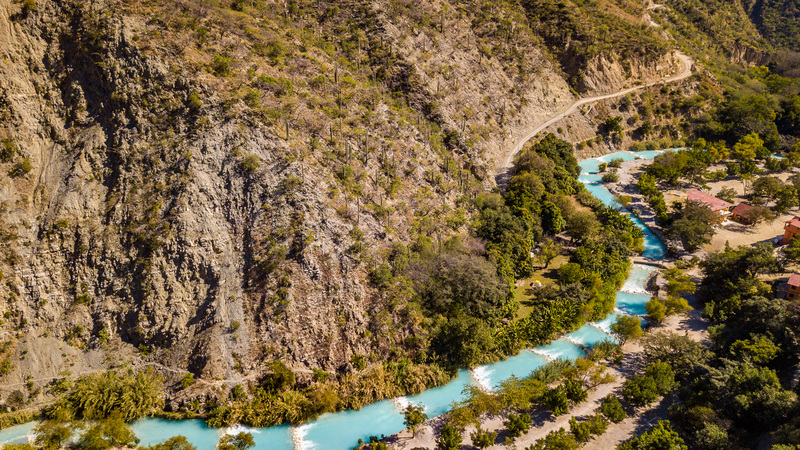 The turquoise river is coloured by calcium and other minerals. 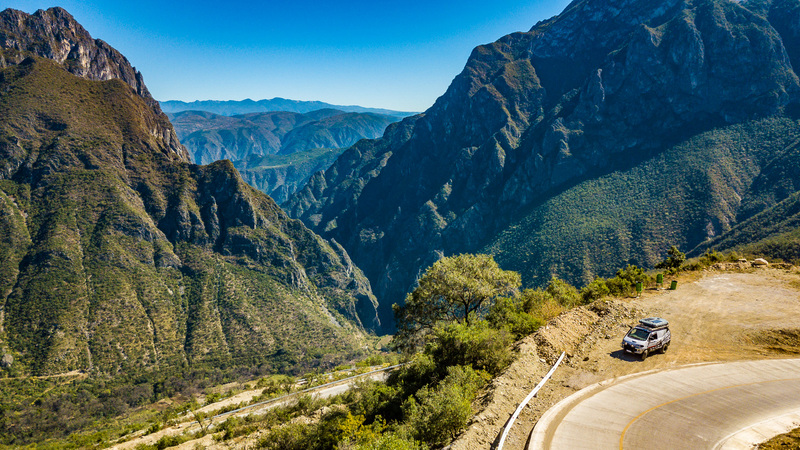 The road into the canyon can be quite steep and windy at times. But the crazy drive is definitely worth the effort! Vanda at the rim of the canyon, about to make our descent. Entrando em um dos lugares mais incríveis onde estivemos até agora. Dentro da caverna. Cachoeira de água quente ao fundo.